While Tim Tebow’s baseball career doesn’t appear to be headed toward a major league debut this season, he remains an interesting story in the sports world. The former NFL player, and Heisman Quarterback, is attempting to pursue a professional baseball career after nearly a decade of not playing the sport at the competitive level. Tebow is currently in New York Met minor league system and while his performance on the field isn’t exactly turning any heads, there is at least one person who is incredibly interested in him—Michelle Thompson of Arvada, Colorado. The Colorado woman was recently arrested on stalking and possibly trespassing charges after she ignored previous warning to stay away from Tebow and the New York Met practice facility in St. Lucie, Florida. Following her arrest police discovered a copy of Tebow’s book in her car, and a sticker on her driver license stating “I love Jesus/Tim Tebow.” Prior to arrest, she had told police that her and Tebow were in a romantic relationship and had even given the authorities Tebow’s home address as her address when asked where she lived! Stalking in Pennsylvania, like in Florida, is defined as a course of conduct that places another in reasonable fear of bodily injury or cause substantial emotional distress in that person. This isn’t limited to simply following a person around but also includes a variety of communications to the victim. Stalking is a misdemeanor of the first degree in Florida and Pennsylvania, unless the person has been previously convicted of it against same victim or the defendant has been convicted of any crime of violence involving the same victim, or his or her family/household; then it’s a felony of the 3rd degree. The prosecution in a stalking case, like any criminal charge, must prove its case beyond a reasonable doubt. It appears that Tebow’s stalker is charged with a misdemeanor but she may be still in custody if she failed to post the $750.00 bail. Even though she is charged with stalking him, Tebow doesn’t seem interested in pursuing the matter provided that she obtains mental help. This isn’t technically Tebow’s call as Florida, like our Commonwealth, is prosecuting the case but obviously a victim’s cooperation is critical to a prosecution. Many of these cases do, however, result in alternative dispositions through pre-trial program that are available in many states like Florida and Pennsylvania. Even if local authorities and Tebow wanted to pursue the case, however, there is strong evidence to suggest that Ms. Thompson behavior didn’t rise to the level of stalking but rather just a super fan of the former college star. 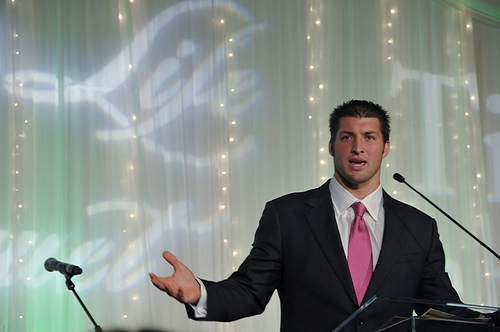 During a press conference, Tebow himself didn’t appear emotionally distraught over the incident and none of press stories covering the incident portrayed him as upset. Remember the prosecution has to prove all of the elements of criminal offense beyond a reasonable doubt. This is a high evidentiary standard. In addition to the stalking charge, Ms. Thompson could also face trespassing charges. Like stalking criminal trespass can be a felony or a misdemeanor charge depending upon the circumstances. Trespass is a felony of the second or third degree based on the level of force used to enter the premises (break-ins are felonies of the second degree while all other types of entry are felonies of the third degree). It’s a misdemeanor when the individual is a “defiant trespasser” and simply entered the premises without permission or that he or she disregarded “no trespassing” or “do not enter” signs. If charged, Ms. Thompson will more than likely face a misdemeanor given that there is no evidence that she broke in but simply wouldn’t stay away from the facility. For more great information on criminal defense topics, please keep reading our blog and as always, visit our free download section for more information.